Cologne - With four points from their opening two matches, Hertha Berlin have made an impressive start to the new Bundesliga season. Now though they face a trip to table-toppers Borussia Dortmund. 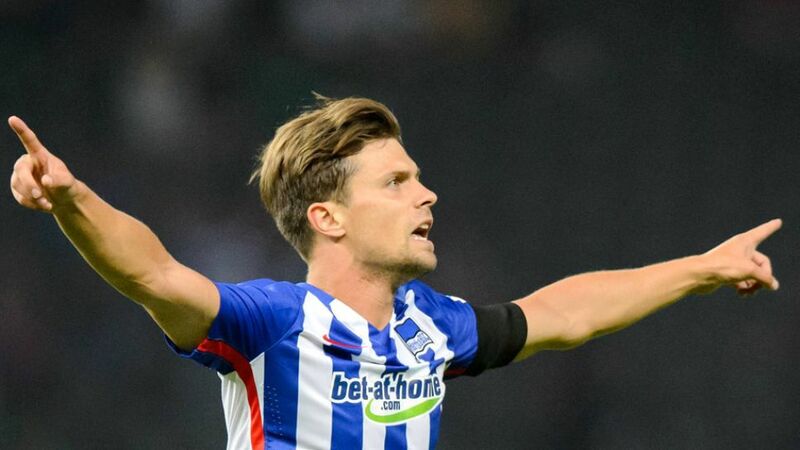 Ahead of the match, bundesliga.com caught up with Hertha’s Swiss international midfielder Valentin Stocker. bundesliga.com: Valentin Stocker, how happy are you with four points from two games at the start of the season? Valentin Stocker: I am happy, even though we could have got six points. But we have to stay modest. We could also have conceded another goal in Augsburg or against Bremen. So we are happy overall. bundesliga.com: What has worked well and where do you need to improve? Stocker: We’ve allowed fewer shots on goal. You can never eliminate the possibility because our opponents also know how to play football. We need to take more of the chances we create, but we are happy that we are at least creating more. bundesliga.com: After a difficult start, you weighed in with three goals and nine assists in the second-half of last season. How satisfied are you with your personal development? Stocker: I would have liked to have played more at the start but things weren’t going so well. But that’s football and that’s life - things don’t always just get better and better. So I am glad that I could, and still can, show people in Berlin what I can do and that I enjoy playing here. bundesliga.com: On Sunday, Hertha travel to table-toppers Borussia Dortmund. You’ve pulled off a few surprises there in recent years. How can Hertha prevail in Dortmund? Stocker: We have to play to our own strengths and stick together as a team. We need to follow the tactical plan as a team and show unbelievable commitment and desire when we win the ball. We need to take advantage of any chance that Dortmund might give us because one thing’s for certain: If Dortmund hit top form then it’s going to be very difficult for us anyway. bundesliga.com: It’s the international break after the match in Dortmund with European Championship qualifiers. How do rate Switzerland’s chances? Stocker: I think it’ll be difficult against England as they have already pulled away at the top. But we are focussed on second place. The match against Slovenia will be decisive. We’re playing at home in Basel and if we win then we’ll be as good as qualified. We’d be six points clear of third place with two games to go, although anything can happen in football.